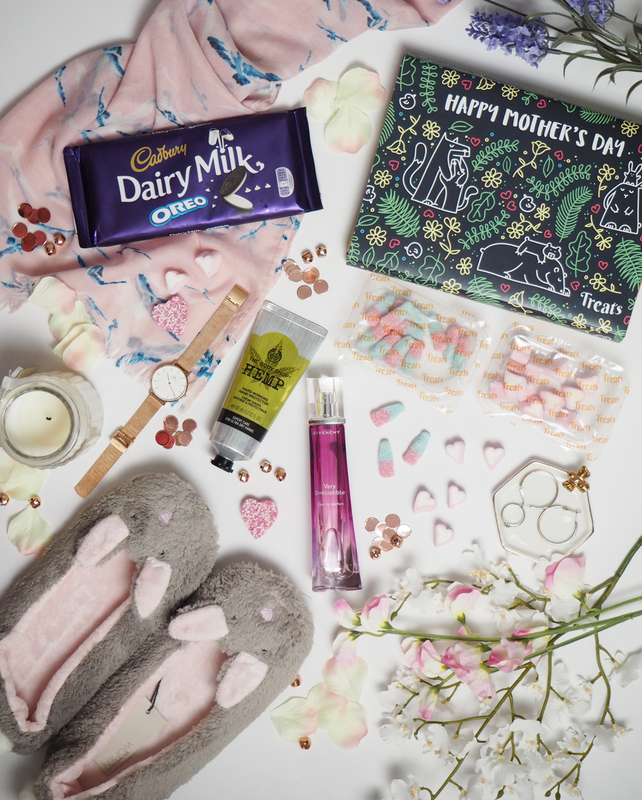 Mothers day is soon approaching, and we all know how much I love a good gift guide. My mum is the most amazing woman I know, and although as a family we’re not big on the whole Mothers Day, Fathers Day thing, I do like to treat my mum once in a while. Luckily for me, her birthday is the 7th March so usually, we’ll bundle the two together! There are so many different types of gifts you can get for mothers day. Some can afford to go for luxury items, while others would simply prefer a nice handmade gift or a trip out for coffee. I’m hoping to cover all prices in this guide – so hopefully you can find something perfect! First things first, food. Food is always the most obvious one, is it not?! When Treats offered to send me some of their boxes for mothers day I jumped at the chance! Who doesn’t love some good sweets, especially when they’re delivered to your door?! Treats very kindly sent me two of their mothers day boxes to try. Each came with super cute mothers day packaging, and 4 boxes of sweets inside. You can tailor your box for whoever you’re gifting it to which I think can be a really sweet, personal touch! They have so many choices for sweets too, My mum loves lemon sherberts so I’d definitely have a box of them in there for her! If you fancy this, you can get your own box here. Of course, sweets aren’t the only option. Everybody is partial to a bar of chocolate, or maybe you could think out the box and get some spices or ingredients if your mum, like mine is an avid cooker and baker! TKMaxx always seem to have some great little food selections so I’ll definitely be making a trip down there this weekend. Another good choice of gift is beauty. My mum loves The Body Shops Hemp Hand Cream. She’s been using it for as long as I remember, so this is always a safe option for any occasion! There are always all sorts of beauty gift sets such as this one from Elemis. Every mum deserves a good pamper so anything which can be added to a bath, or used for a good pamper session is great! Maybe you could even book your mum into a spa day! If you’re sensible, you’ll book it for two so you can sneak in a nice relaxation session too! Accessories are another fab choice. Is it just me or are scarves a total mum thing? My mum has so many! Fat Face or White Stuff are always my first port of call for items like that. You could always treat your mum to a new watch, my mum loves Swatch watches, but you could always treat her to a swanky Daniel Wellington number. And finally, if you’re really pushing the boat out, you could get a lovely little bag! Radley have so many beautiful bags, of all sorts, and you could even get a matching purse and gift the whole set! An obvious option is of course Fragrance, and I wont bore you on this one because I have seen so many fragrance gifting posts recently. Personally, my mum is a massive fan of …. But you could go for one from Diptyque, L’Occitaine, or Chloe! Now they’re all the obvious choices, but there is so much more. You could do something which involves some quality time with your mum like afternoon tea or a spa day. Everyone loves being cosy so why not get some cute slippers, some PJs or a dressing gown? My mums always in the kitchen, so a browse on Antrhopologie might find her some brilliant new kitchenware. And of course there’s all the novelty gifts – ASOS and Tiger seem to be great for these. I hope this post has given you some ideas, you can shop some of my picks on the widget below. "February reflections and looking forward to March"